Nikita Khrushchev, who gained world fame as the Soviet leader who broke with Stalin's rigid interpretation of communism, was born in a province of Ukraine on April 17, 1894. Unlike Stalin and other Soviet leaders, Khrushchev, the son of a miner, rose up from the ranks of the working class. His job as a pipe fitter (which he began at fifteen) exempted him from service in World War I. Yet, eager to change Russia, he joined the workers' struggle before the 1917 Revolution erupted and by 1918, he had joined the Russian Communist party (the Bolsheviks), and served as a political worker for the Red Army in the civil war. The following year he joined the Red Army and fought against Polish troops. His service won him admission to the new Soviet schools where he quickly rose through the party ranks, becoming secretary of the school's Communist Party Committee. By 1925, he worked for the party full-time and became known for his hands-on understanding of mine and factory conditions. His reputation as an effective and enthusiastic party organizer propelled his rapid rise within the party: recipient of the Order of Lenin and first secretary of the city of Moscow in 1935, and a member of the Politburo in 1939. Khrushchev managed a number of experimental agricultural campaigns, such as the Virgin Lands Project, which attempted to cultivate lands in the harsher climate regions like Kazakhstan and Siberia. His failure to collectivize Ukranian farms led Stalin to demote him in 1947, but Stalin called him back to Moscow two years later to lead the Moscow City Party. Determined not to be displaced again, Khrushchev consolidated his power, often clashing with Stalin's designated heir, Georgy Malenkov. Khrushchev's control of local party leaders secured his challenge and ultimate defeat of Malenkov. In 1955, he controlled the Soviet Union. As he traveled outside Russia, Khrushchev gained world fame as the Communist leader who denounced Stalin's repressive tactics and for his brash, diplomatic style. He led the political and intellectual thaw of the 1950s Cold War, which resulted in the "rehabilitation" of thousands of political prisoners whom Stalin had imprisoned in Siberian labor camps. He reduced the power of the secret police by replacing the NKVD with the KGB and outlawed torture. Yet his reform had clear limits. Khrushchev cracked down on many religious groups and destroyed or closed down numerous churches. 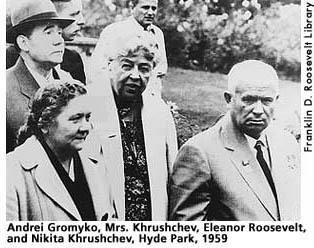 Khrushchev met with Eleanor Roosevelt in 1957 in Yalta, where ER went to interview him for The New York Post. Their meeting became more debate than exchange as they discussed differences in arms proliferation, the fate of Soviet Jewry, and violation of the Yalta agreements. But they left each other with their spirits intact. When the premier asked if he could tell the reporters they had a "friendly discussion," ER, smiled, and replied yes, but be sure to say "that we differ." To which Khrushchev laughingly countered, "at least, we didn't shoot each other." (1) When Khrushchev came to the U.S. in 1959, he visited ER in Hyde Park where they discussed disarmament of the two nations. ER and Khrushchev found little common ground. Ultimately they agreed to disagree on everything except that both nations ultimately wanted peace. After the Bay of Pigs fiasco in 1964, Khrushchev was upstaged by a coup, and "asked" to resign by his fellow Communist party leaders. He died of a heart attack September 11, 1971. Joseph P. Lash, Eleanor: The Years Alone. (New York: W.W. Norton & Company, 1972), 217. "Khrushchev, Nikita Sergeyevich." New Encyclopædia Britannica.Vol. 6 Encyclopedia Britannica, Inc., 1997, 843-845. Lash, Joseph P., Eleanor: The Years Alone. New York: W. W. Norton & Company, 1972, 269-272. Roosevelt, Eleanor, On My Own. New York: Harper & Brothers, 1958, 229-230.